Encompassing a club festival and music conference, Jakarta Annual DanceMusic Event will see a comeback on December 2-6, 2009. 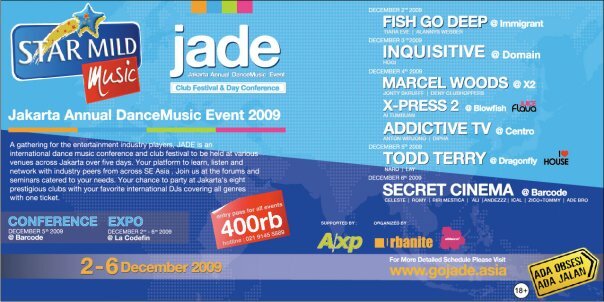 Along with the mission of education and networking, JADE will feature a spectrum of dance music through a wide array of international, regional and local DJs in several of Jakarta’s best clubs. With “Music and Technology” as the central theme to JADE’s conference, we invite you to realise your questions and desires from the electronic music business. Meet the international and local panels who will chair several forums and demonstrations over new technologies. Come explore and discover your potential at JADE!